Here are a few calls for papers that I thought might be of interest. 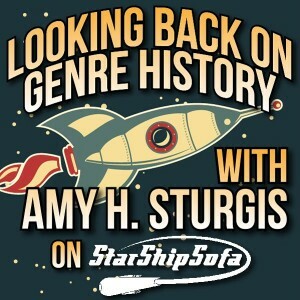 In other news, my most recent "Looking Back on Genre History" segment on StarShipSofa discusses the relationship between Star Trek and Arthurian literature. It's here on Episode 431. If you listen, I hope you enjoy! Star Trek and Arthurian literature? Fascinating! *g* I think I'll have to have a listen. Yay! *g* Thanks so much! I listened & I definitely enjoyed. What a fascinating approach to Trek! Thanks so much! I'm so happy you enjoyed it. The second (and final) part will be up soon. By the way, speaking of enjoying things, I just finished The Doom That Came to Providence (so clever! ), and your "That There are Stars" provided the absolute perfect ending note. Gorgeous! Glad you enjoyed the poem!